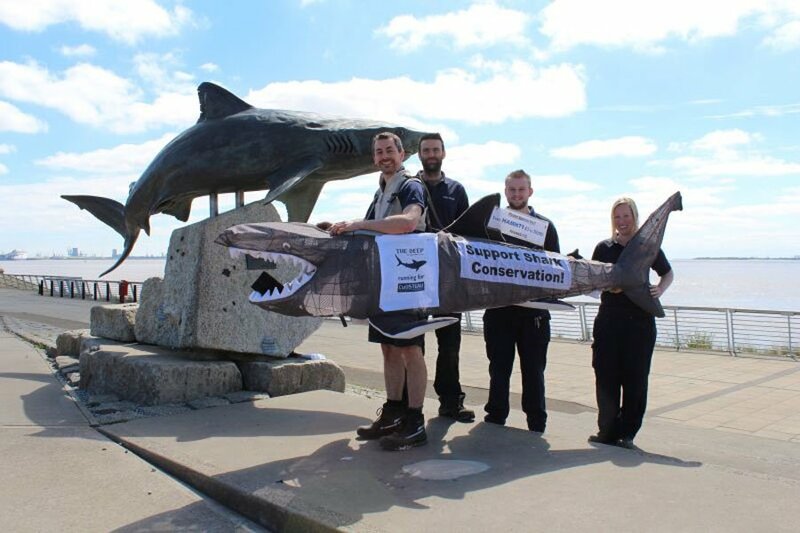 Five members of The Deep crew dashed towards the finish line in the Hull 10k over weekend in a bid to raise money for vital Manta Ray conservation work in the Red Sea. The team was made up of Aquarists Tom Rowe, Graham Hill and Emma Burke as well as Guides Jon Mole and Adam Atkinson. Not to be outdone by any other competitors, Graham Hill ran the race in his 3 metre long shark costume as donned for the London Marathon in 2013 (As pictured)! All money raised will be going towards buying acoustic tags to help with The Deep’s pioneering research work in partnership with Equipé Cousteau on Manta Rays off the coast of Sudan. This equipment will help to gain vital data on the rays’ populations, movements and feeding habits in previously unstudied areas. The next phase of work is set to take place later in 2015, where The Deep’s aquarists will use UAV’s (Unmanned Aerial Vehicles) to monitor and survey the Manta populations. The use of this technology will allow the scientists to search for the rays in the tagging programme and also to study the surface water slicks along which the Manta have been seen to converge. If you would like to sponsor The Deep please visit our web page. All donations will be gratefully received.